I’m spending a few days with my family in Jonkoping and found an album with postcards printed ca 1890-1910. A spread of postcards sent from USA. Upper left; Niagara Falls – Cave of the winds – Frozen solid stamped in 1908. Lower left; Water works park, Rockford, Illinois – stamped Oct. 1907. Upper right; Residence of Mr. Potter palmer, Chicago – stamped July 1903. Lower right; Statue of Linné, Lincoln Park, Chicago – stamped Sept. 1903. Through the post marks on the back on one of the cards one can get information regarding the postal services of the days. 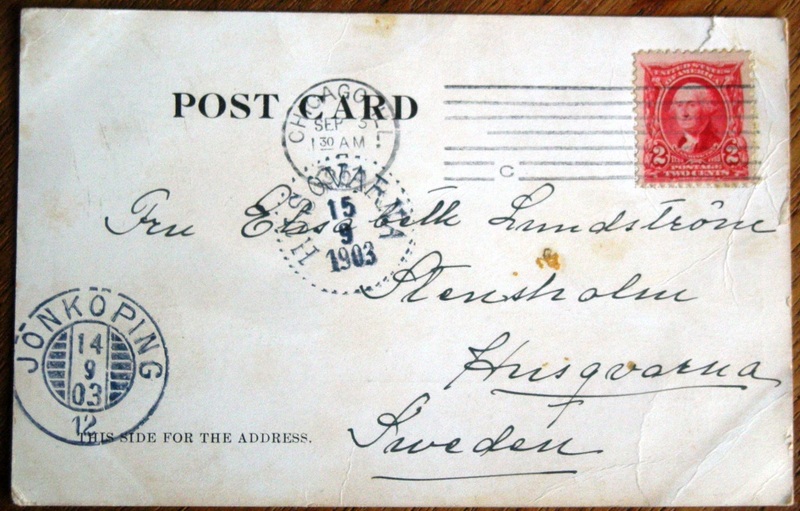 This postcard is postmarked in Chicago Sep 3rd 1903 and came to Jonkoping, Sweden, on September 14th 1903 and finally to its recipient in Huskvarna on the 15th. In all it took the letter 12 days to travel from Chicago to Huskvarna. 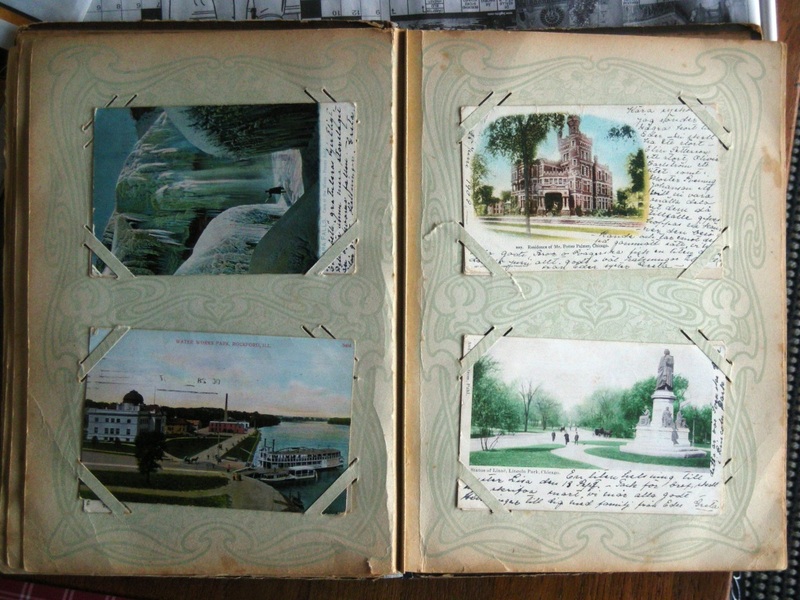 I don’t know the persons who wrote them or received them but there is something special with old postcards. Even if you recognize the spot on the card, the environment is different. Perhaps one or more houses are the same that exist today, others have disappeared or been built, the clothes people wear are outdated and the cars antique etc. others are just beautiful pictures and snap shots of time gone by. I’ve picked out a few postcards that I’ll share with you. 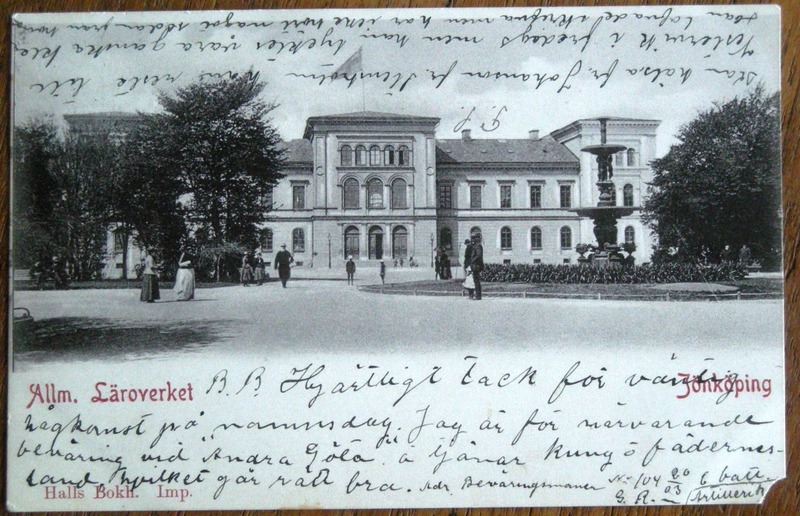 Per Brahe gymnasiet (Per Brahe high school) or as it was called when the photo was taken Jonkopings allmänna läroverk (Jonkopings public school). I went to this school between 1989-1992 though at the time I studied there this building had become the town hall. 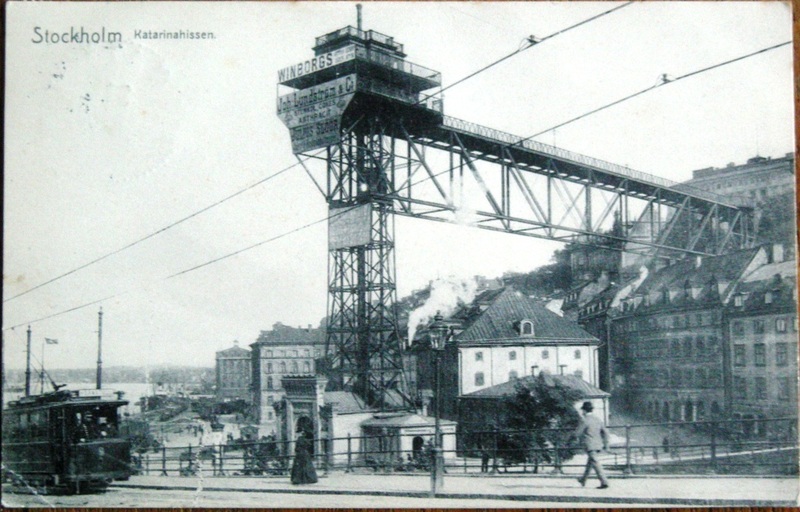 Katarinahissen (the Katarina elevator) at Slussen in Stockholm ca 1900. 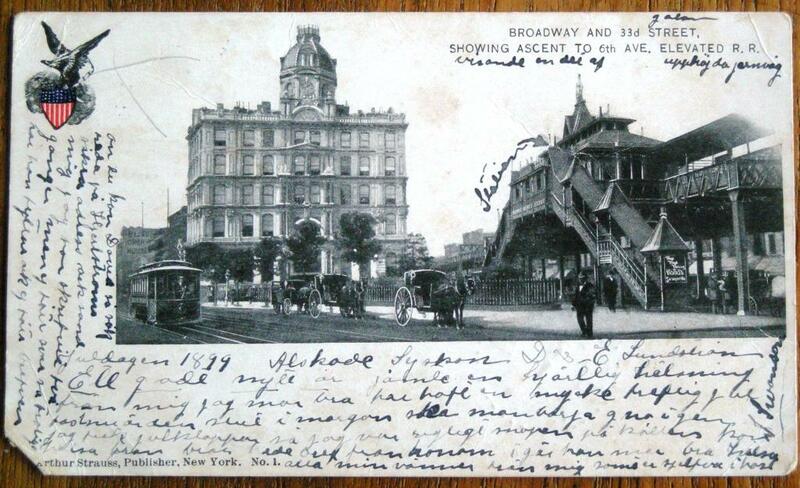 Broadway and 33d street, showing ascent to 6th Ave. Elevated R.R. photo taken 1898. Then I found a couple of “mystery” cards which made me want to know more so I googled them for information. This is what I found. 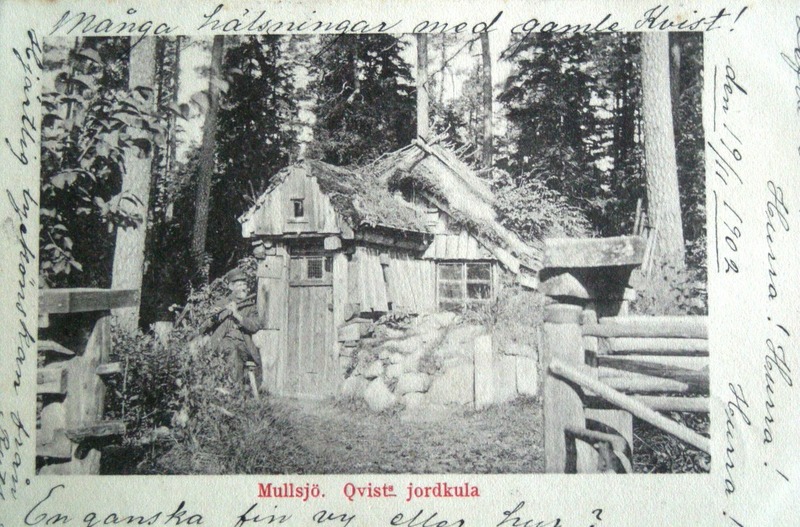 Qvist’s hut in Mullsjö, some miles WNW of Jonkoping, ca 1900. Magnus Qvist (1836-1910) lived in this hut for some decades, there is only a few facts known of him. Before building his hut he travelled abroad and presumably worked as silk weaver in Lyon, France. During his years in the hut he made wooden shoes for a living and was something of a tourist attraction as he gladly entertained visitors with stories and music (flute) and made whistles for children. Today there are only a few traces of the hut, though they are not registred in FMIS (The Archaeological Sites and Monuments database) which it should be. Next time I visit Mullsjö I’ll try to locate the place and take a few photographs. 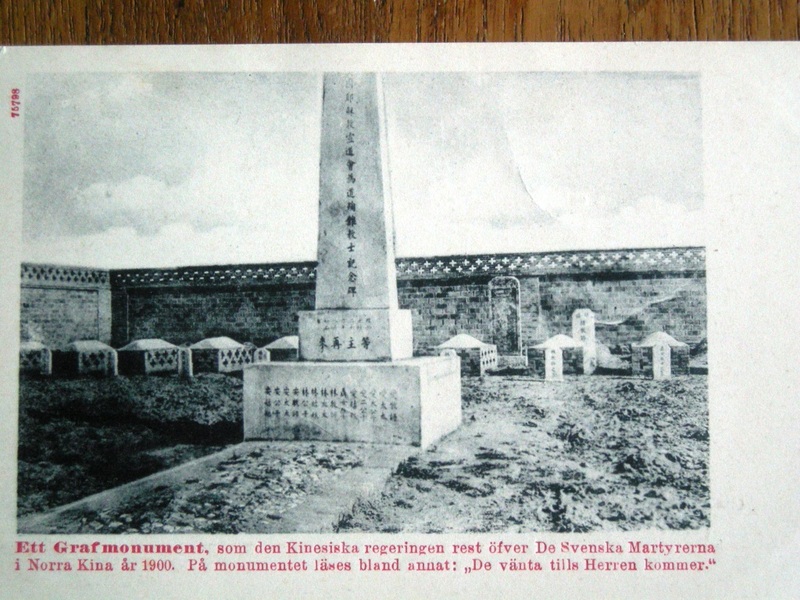 A (grave) monument erected by the Chinese government 1900 over the Swedish martyrs in northern China. This probably refers to the missionaries that died during the the Boxer Rebellion, a.k.a. the Boxer Uprising a.k.a. the Righteous Harmony Society Movement; 1898-1900. The uprising was a respons to the increased expansion of western influence in politics, economy and religion. During the uprising ca 230 missionaries were killed of which 41 were Swedish.